A friend is someone who knows all about you, and loves you just the same. For our 3 year anniversary Jonny suprised me with a trip to San Diego. He had it planned for 3 months and I had no idea. About 5 days before he told me we were going somewhere so that I could make sure I got off work on time. The night before he told me what to pack. I had no idea where we were going until we were at the airport. Jonny is so good at planning sweet surprises. 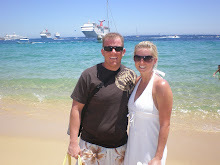 San Diego has so many memories for us, its where we started our new lives together after we got married. It was the best weekend ever. The weather was great and we stayed in an amazing beach house right on the boardwalk in Mission Beach. Our beach house- we stayed on the left side. The front widows and doors opened all the way so the whole front of the house could be open. This is what we woke up to every morning. It was AAA-MAZING! View of the boardwalk in the morning. It was so fun to see all the joggers and bikers out exercising. Before our morning jog on the boardwalk. Laying out on the beach. It was so convenient staying right on the beach. We didn't have to pack a bag with all our beach gear because our house was right there. We played catch, laid out, read books, and while I napped Jonny made friends with our neighbors and play bochi (sp?) ball. Jonny braved the freezing water and body surfed. I took pictures. Eating at one of our favorite restaurants in Old Town- Fred's Mexicana. Yummy. We gave our leftovers to a homeless man outside the restaurant. Hanging out at Belmont Park. Eating breakfast while watching the waves. It was such a fun trip and a great way to celebrate our anniversary. I'm so grateful for Jonny and love him more each day. I'm a lucky girl! 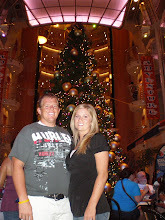 Christmas time on the cruise! Landon's Birthday and Father's Day! The Holt Family "Updater Blog"
my photography website is live! Loved you then, Love you now, Always have, Always will!